Argentina « Why did you click here? 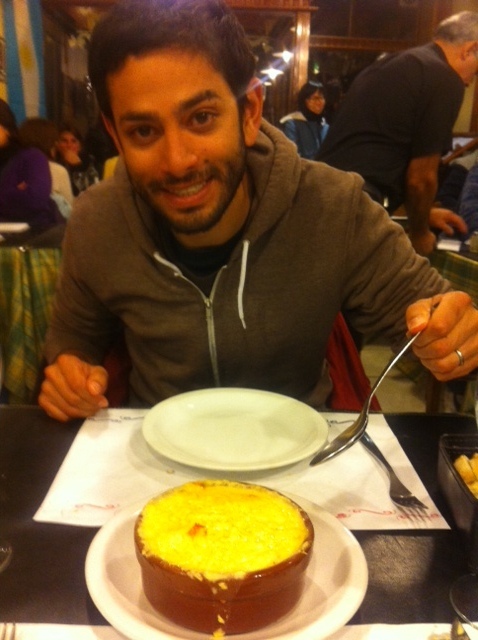 Regardless of what the Argentines can and cannot figure out, they got the food game down. Centolla, or spider crabs, a speciality from Ushuaia, alllll the way down south. This was cooked in a parmesan cheese sauce, and thus was delicious by default. 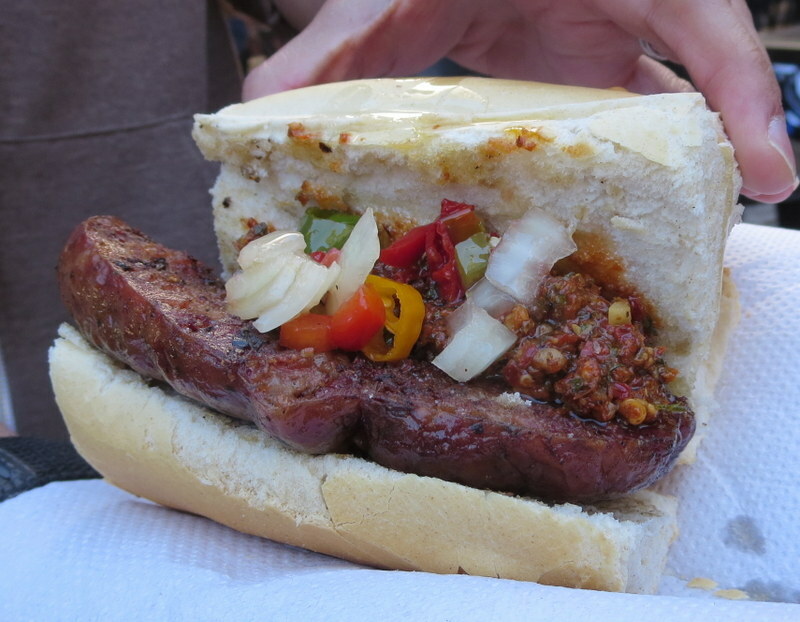 We lived off of Choripans for a while in Argentina, a clever combination of chorizos and pan (bread). Submerged in chimichurri sauce and plied with other vegetable-related toppings, this is a ubiquitous and tasty street food item. 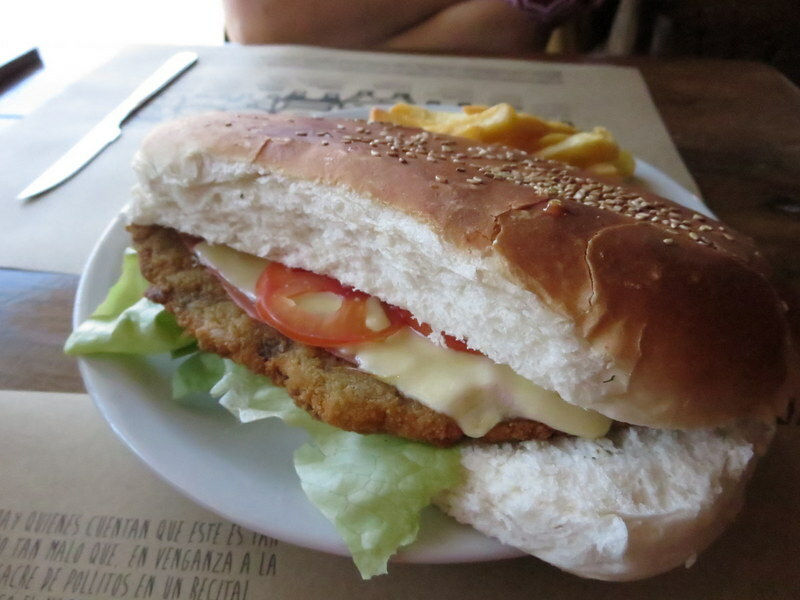 And now we come to the most famous of all Argentine sandwiches, the Milanesa. In an attempt to rival the Chilean chacarero (but in between us falling a bit short), a thin strip of veal is breaded and then put on more bread. Milanesa can refer to a type of meat preparation as well – usually veal, but you can have chicken, pork, or even llama milanesas. Found all over Argentina, they are also typically as big as your face, but could use some sauce (i.e. aji from Chile as well! – ok fine, we just really want a chacarero instead). You can also get it not as a sandwich as well, for those more Atkins inclined (its still breaded and massive). 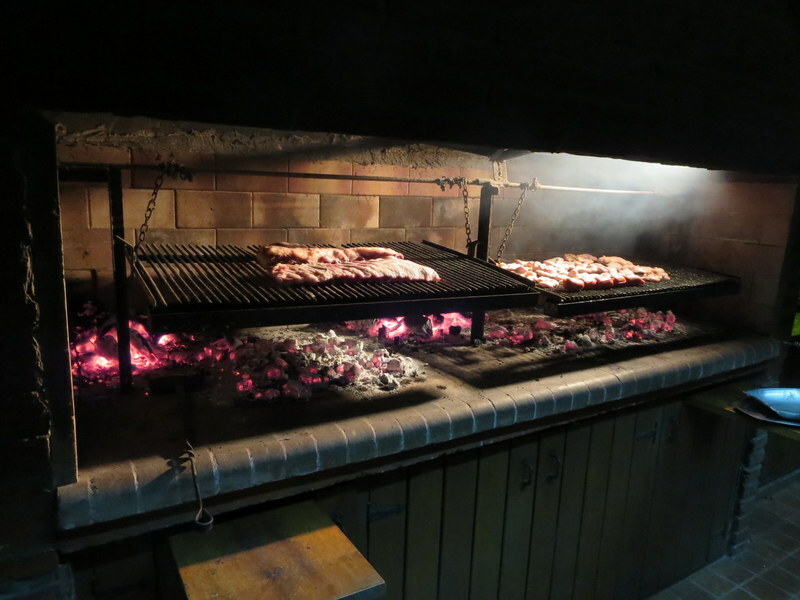 A typical Argentina barbeque, filled with as many different types of meats as you can count, or an asado, is a blissful event. 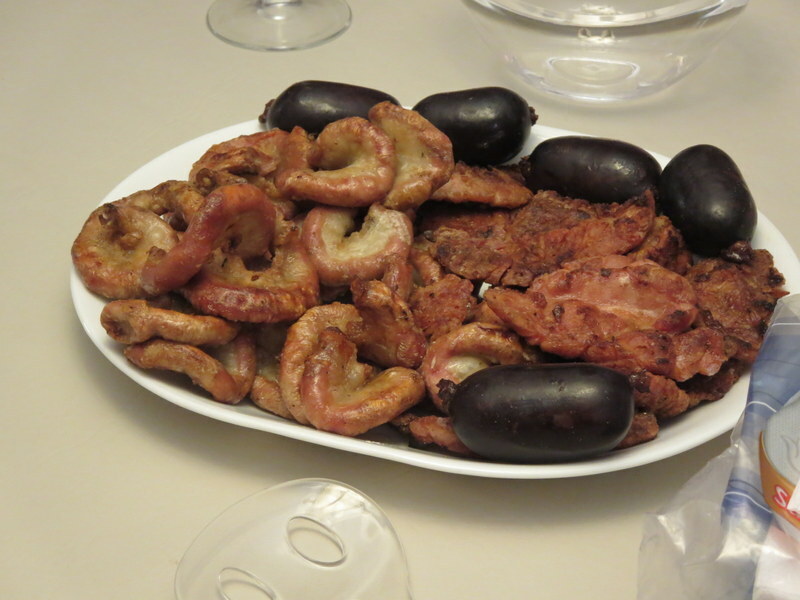 In this case, we had a combination of blood sausage, sweet breads, and intestines – nothing goes to waste. Parillas (grill) restaurants grill up a lot of delicious things, but its hard to top the Chivto, basically a young goat. I could never be a vegetarian. 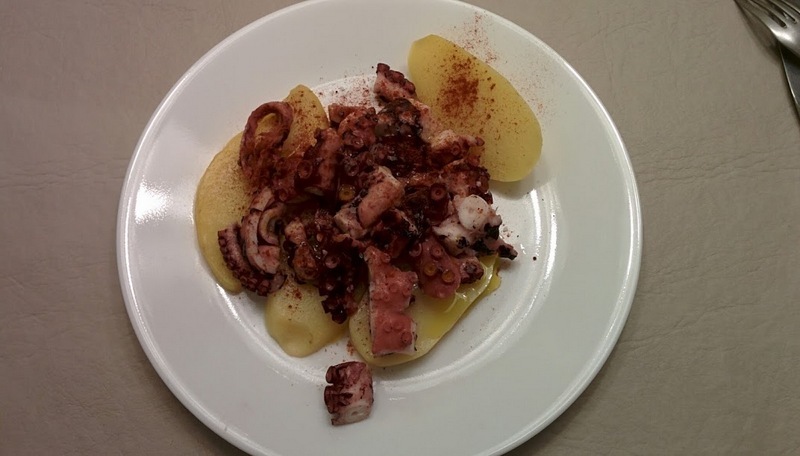 Pulpo, or octopus – homemade in this case with potatoes, pepper, and olive oil. The Chinese in Buenos Aires apparently have the best octopus, which may or may not be manufactured in a factory. Random places, such as a mechanical garage, will set up a Sunday BBQ outside, throwing tons of meat on the grill until they sell out. 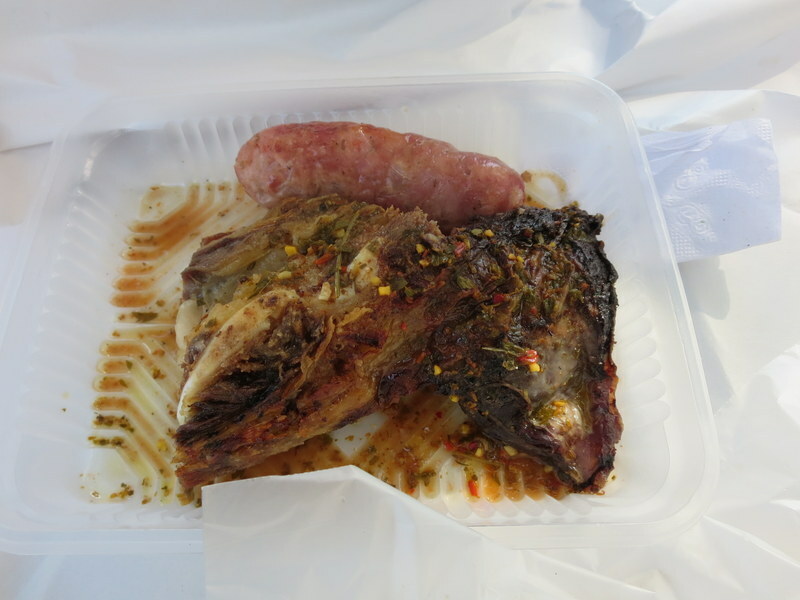 In this case, we came late but still managed to secure one of the last pieces of beef, and of course a chorizo – drenched in chimichurri as usual. 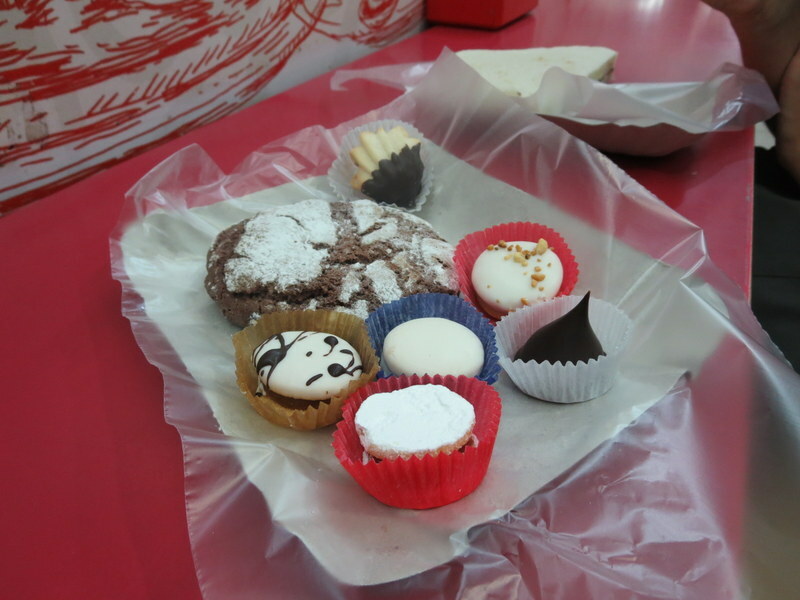 Argentina bakeries are some of the best places on earth. 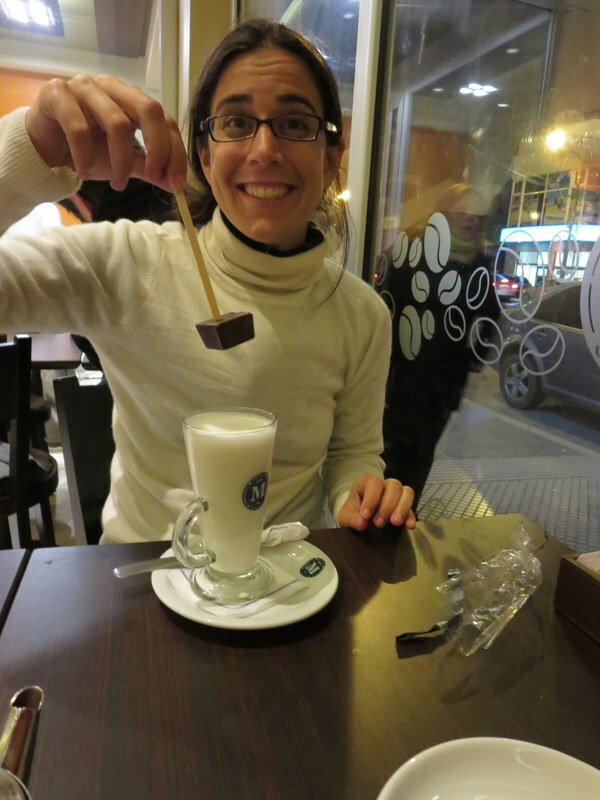 Most of the cookies are alfajor based, or with dulce de leche in between two layers. These are also mainly dipped in chocolate, and thus are amazing. Trying to buy just one is simply impossible (something I attempted here, and come home with seven). 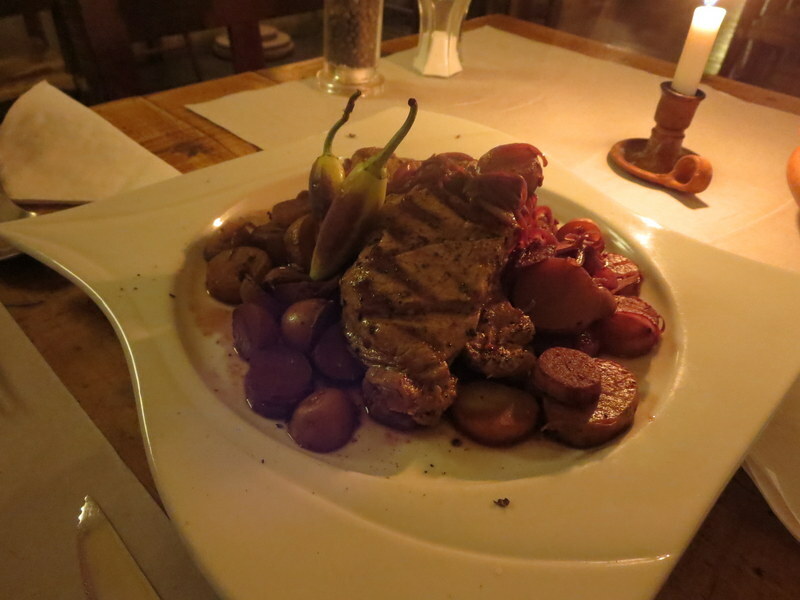 Llama steak – we thought it was rare, but see it in Bolivia now all the time! 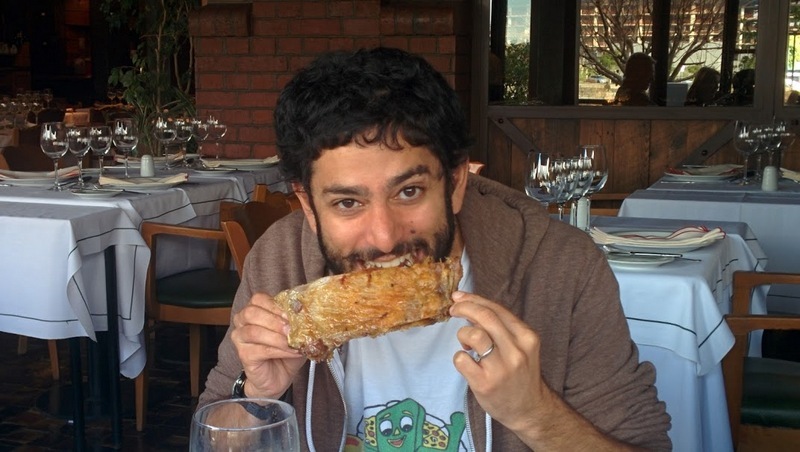 Doesn’t make this first fancy foray into the world of llama consumption any less delicious. If you ever go to Argentina (or even South Carolina randomly), go to Freddo’s Ice Cream. Get any dulce de leche flavor, and then you can die a happy person. 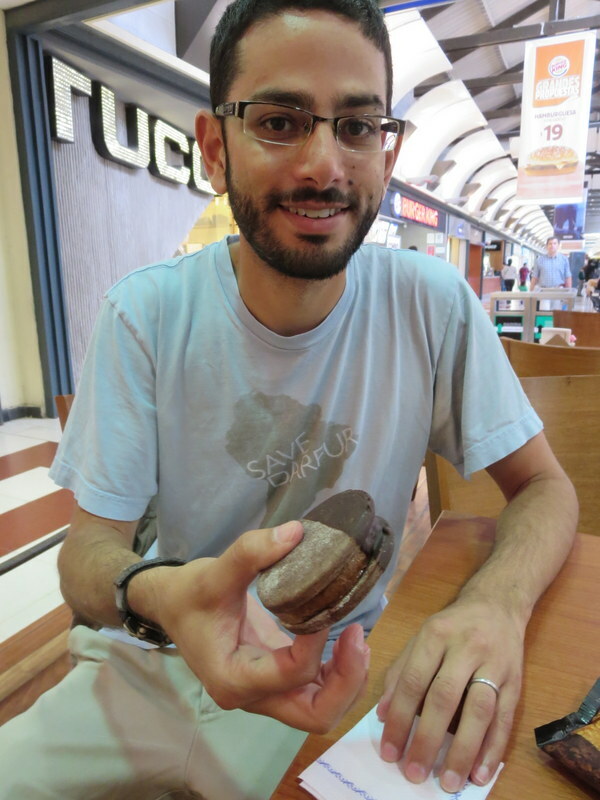 They even had an ice cream alfajor sandwich (something Christine simultaneously invented), but I’d stick to the ice cream itself. 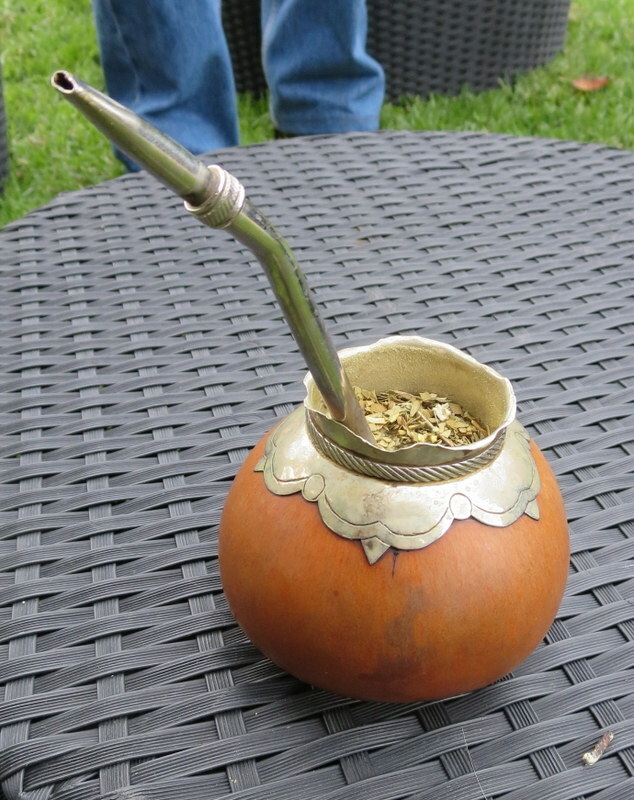 In Argentina, but especially Uruguay, people carry unwieldy thermoses of hot water with them all over the place to make mate, a bitter looseleaf tea that you drink out of a open cup, often a gourd, via a metal straw with a filter on the bottom. Often a social activity shared amongst a group, mate is also highly caffeinated, and may help explains Uruguay’s recent decision to legalize certain substances as a counterbalancing effect. How could we go this long without talking about licuados? Take any fruit, add milk or water with a little sugar, and you’re good to go. Strawberry tends to be the most manly choice. Submarino, or basically make-your-own hot chocolate. You are provided hot milk and some chocolate on a stick, the rest is up to you (don’t worry, it’s hard to mess up – even if you look like a cartoon). Ok time to go eat! A quick Google search describes the Tri-border area between Paraguay, Brazil, and Argentina as “lawless,” “a classic terrorist safe haven,” and “Hezbollah’s Western Base.” Somehow they always seem to forget to mention it as the site of the spectacular Iguazu waterfalls – which are a rare mega-tourist attraction that lives up to all the hype. That was our main draw to cross through the region, starting one day in Argentina and ending in Paraguay, while spending the middle part in Brazil – but the allure to see how “lawless” this region actually is, was another significant draw. The region is home to an estimated Arab community of 25,000, who mainly came from Lebanon after WWII and during the civil war in the 1980s. Combined with its renowned reputation as a contraband “oasis,” concerns were raised to the point where the United States even established a joint intelligence center on the Brazilian side of the border. At any rate, much of that concern dated from the mid-to-late 2000s, with nearly half a decade elapsing by the time I showed my face in the area (which perhaps is never a good thing in the vicinity of a Middle Eastern-focused intelligence center, especially two months into a beard). Starting in Puerto Iguazu, Argentina that day (we had seen the Argentine side of the Iguazu waterfalls the day prior), we left early on a bus for the Brazilian side of the falls. The border processes there were simple enough – on the way past the Argentine side, our bus driver collected all of our passports and got the exit stamps himself, while on the Brazilian side we had to individually appear, but it went quick enough (note: want to talk about suspect financing?? 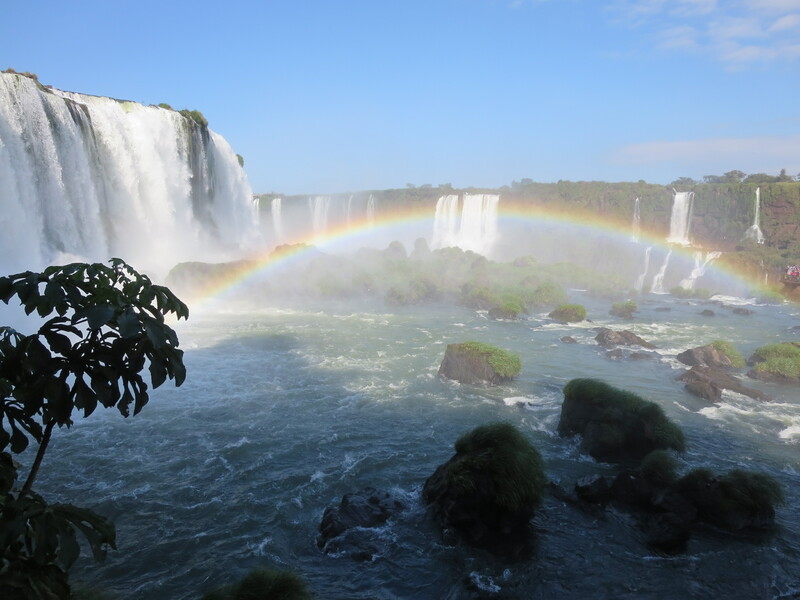 I had to obtain a Brazilian visa in Buenos Aires for $160 just to be able to visit the falls! Even if it is a ten-year, multi-entry affair). We toured the Brazilian side, which offers significantly different but equally as stunning views as the Argentine side, then made our way on a city bus to the main terminal in the Brazilian city of Foz do Iguaçu. 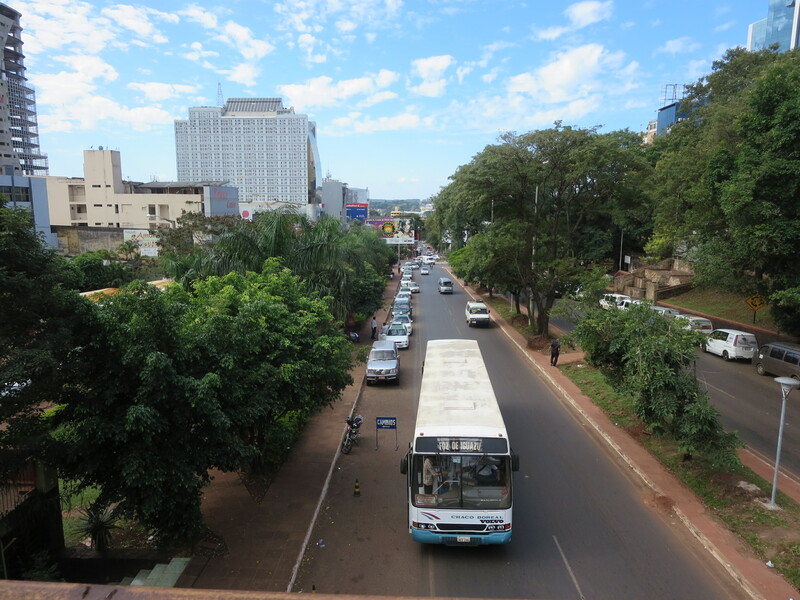 Things began to get a bit more interesting here – there is a normal city bus that runs between Foz do Iguaçu, Brazil and Ciudad del Este, Paraguay, as they are just across a bridge over the Paraná River from each other. We waited at the stop for the frequent bus, and headed for what was technically the fifth country of our trip (if you count 5 hours, at the cost of $160, in Brazil). Anyways, we had to get off the bus to get a Brazilian exit stamp (or rather I did), so we told the bus driver at the beginning that would be the case. He handed us a slip of paper so we could get back on a different bus – as this one would not wait around for us to complete our formalities. We got off at the border control, willingly I might add, while the bus plowed across the bridge, barely even slowing down. It took us about 5 minutes to complete Brazilian immigration (given that we were the only ones who showed up), then waited for the next city bus to come. We contemplated walking across the Puente de la Amistad (Friendship Bridge) as it was broad daylight, but had heard rumors that this was not safe at all, Not sure how really – it was had a narrow pedestrian walkway on either side – maybe someone could pin you against the edge and threaten to push you off whole taking your bags, but it was crowded and narrow enough that I would doubt they’d get too far. At any rate, we did not bother to find out, as the next bus came in less than seven minutes. We flashed the slips of paper handed to us by the other bus driver, and hopped on the back. 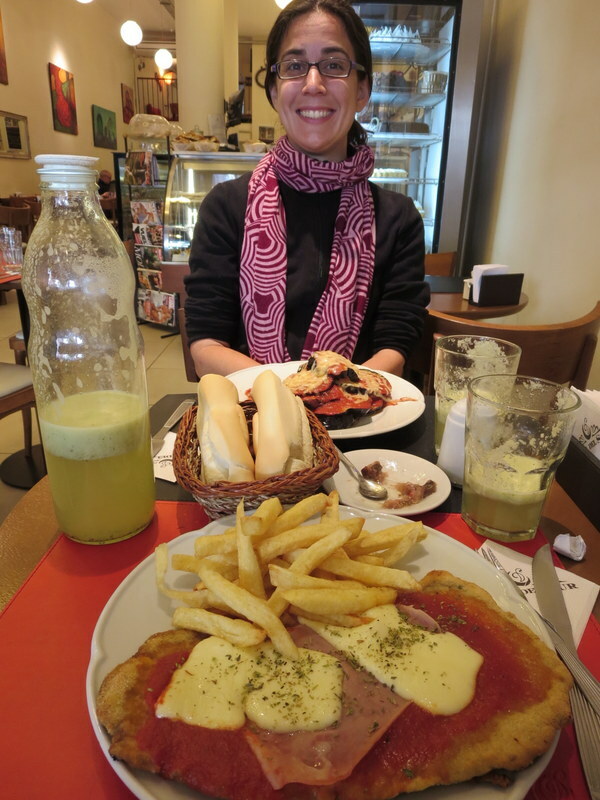 Once we had crossed the bridge we expected the bus to stop at the Paraguayan border control, so we could get off and complete formalities there – a reasonable expectation in my mind, even if most people do not get off the bus. This it did not do. Rather it sped right across the bridge and past the apparently optional immigration office into town – we were already in Paraguay! the site of our illegal entry into Paraguay! We cried for the driver to stop, not wanting to invite any sort of troubles for illegally crossing over. 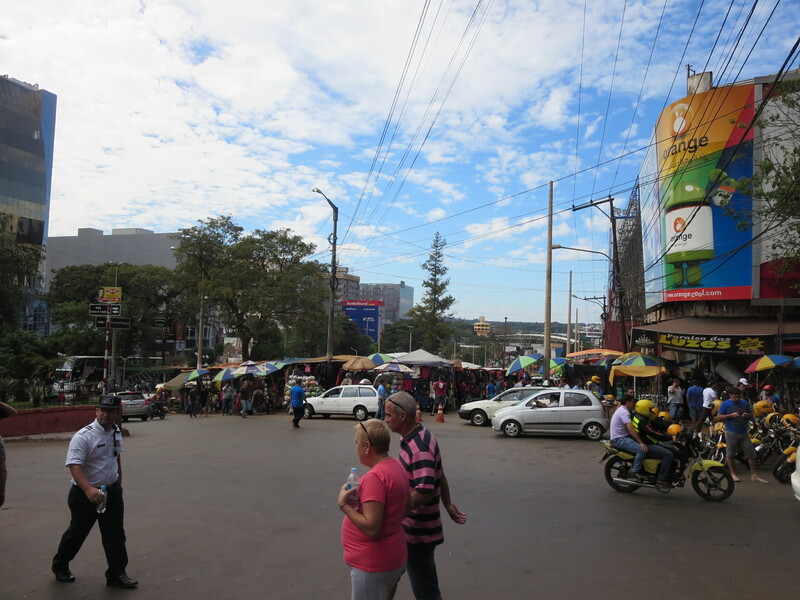 He did a few hundreds meters past the border and at the start of the expansive contraband market that dominates the first few streets on the Paraguayan side (although there a number of geographically-oriented and orderly shopping malls as well, such as ‘Mina India’ and ‘Bonita Kim’). Getting off we looked around confused – maybe that wasn’t the actual border post and we were supposed to go a bit further? 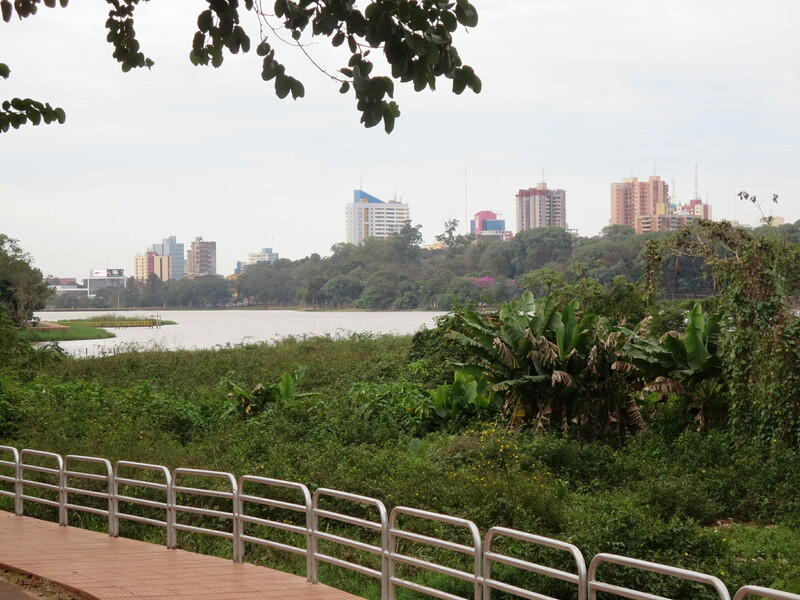 But we were clearly in Paraguay now – you could tell immediately upon crossing the bridge that this was a much poorer country (street food, market stalls, dust, taxi drivers harassing us – you name it, all the elements were there). We decided to walk back to the office immediately after the bridge – they could redirect us if they had to. We went in the first door we saw, hoping no one realized we were coming from the wrong direction (i.e. 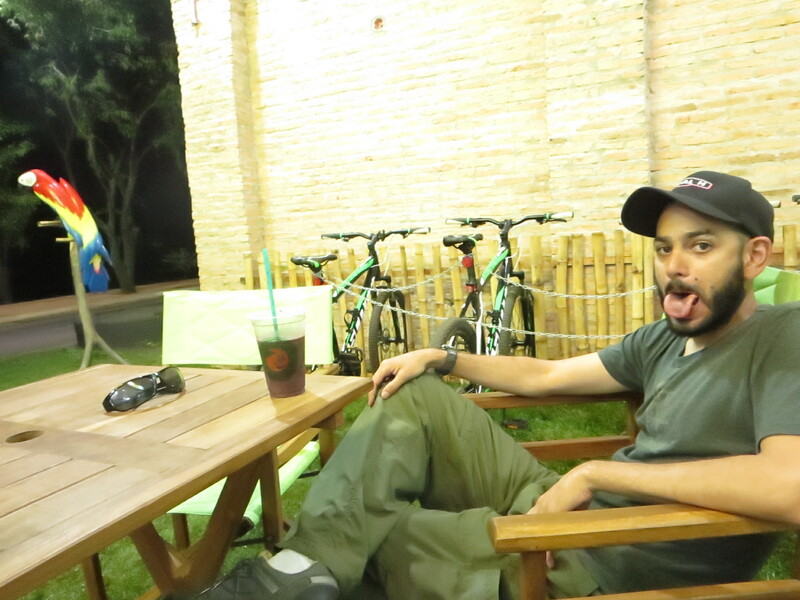 from Paraguay already), and encountered an disinterested man sitting at a desk, a tv blaring beside him. I approached and he did not look up initially, but grudgingly turned to us – I guess since this border process seemed to be “optional,” with most people choosing not to exercise that option, he did not quite have the experience or people skills I would’ve expected. He looked over my passport and visa in less than two minutes, giving me an entry stamp. I was surprised by how quick this was, how few (re: none) questions he asked, and the fact that he did not appear to care about the contents of my luggage, nor barely looked at my face to confirm the passport. I was so taken aback that I asked in broken Spanish if there was anything else we needed to do, since I personally love completing as many formalities as possible at South American land frontiers, but he just waved us off to be gone (actually, I had read some horror stories of people not receiving the proper entry stamps during some of their South American travels and being forced to return to their point of entry to acquire them before they could exit the country, so was determined not to let the laziness of an apathetic border official put us in a similar situation). Following we went back to the area we were dropped off, and boarded the next and third city bus of our 30-minute journey, unsure of where it was going or even if it was the right one (turned out to be fine). 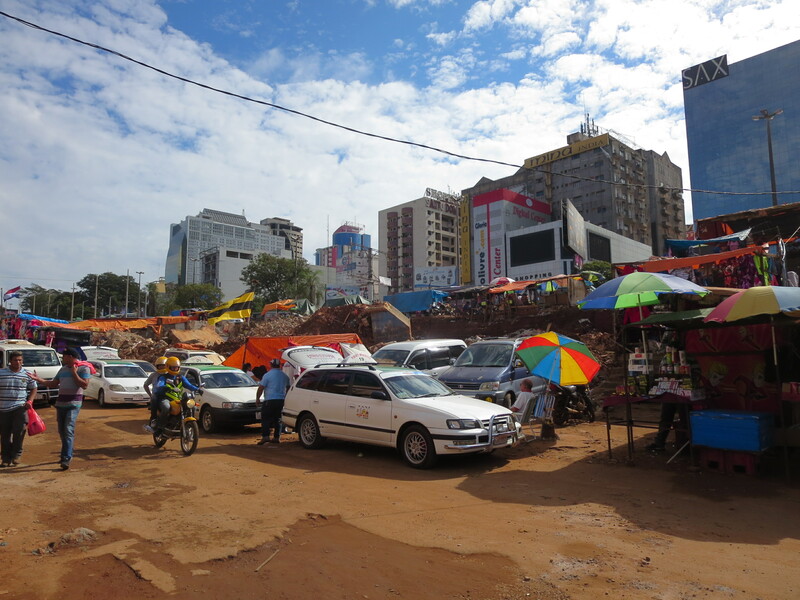 It took us past the market section of Ciudad del Este – which actually is a bit chaotic but replete with anything contraband you could want, from electronics to clothing to kitchen goods. A lot of likely not contraband goods as well – we saw an entire selection of Kirkland Costco products in the upscale Mona Lisa department store – and Brazilian & Argentines frequently cross the border to purchase supplies (when you are not slowed down by any border controls, why not?). We even had a tour guide later at the grand Itaipu Dam tell us you could buy a brand-new car for $200 in Ciudad del Este – an intriguing idea, but given my inability to drive without endangering the lives to today’s precious youth, one we never looked into. 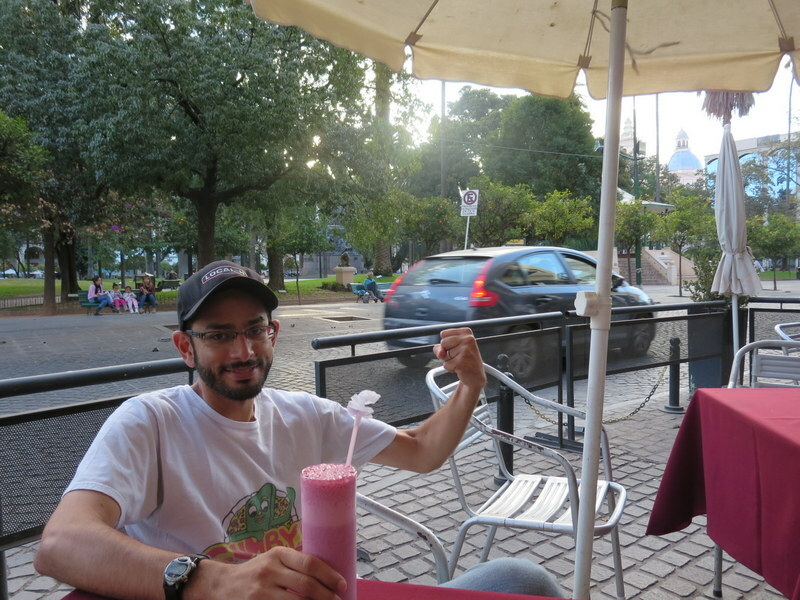 Anyways, Ciudad del Este, Paraguay, the heart of all this ‘lawlessness,’ is actually a very pleasant city after leaving the market area. At the same time, there isn’t much else to do there – everyone we asked just told us to go shopping, especially given that the city was only established in the 1950s and thus lacked the deep history of monuments, buildings, and other pretty things to look at that occupies our time in many a other locations. Regardless, we stayed about a 20-minute walk from downtown in a newly-constructed suburb around a lake, at a hostel with a great view and a pool. So nice it was that Christine, who was previously scared to even set foot in the city after I had informed her of its reputation, expressed serious consideration into purchasing property there (it did help that we also located the best empanada and juice spots of our entire trip nearby). We never did get involved in Ciudad del Este real estate market during our short stay, but at the rate of $200 for brand new cars, perhaps we should have! I was also determined to find some of the supposed ‘Arab’ terrorist sympathizers, and we did (well the Arab part at least)! Mainly we were in it for the food, hoping to score some delicious shawarmas, as we stumbled upon a tall green building in the city center, which contained a food court, barber shop, mosque, and apartment building. The shawarmas lived up to their billing, and as much as I was intrigued, we left discussions of political allegiances and sympathies to a minimum. 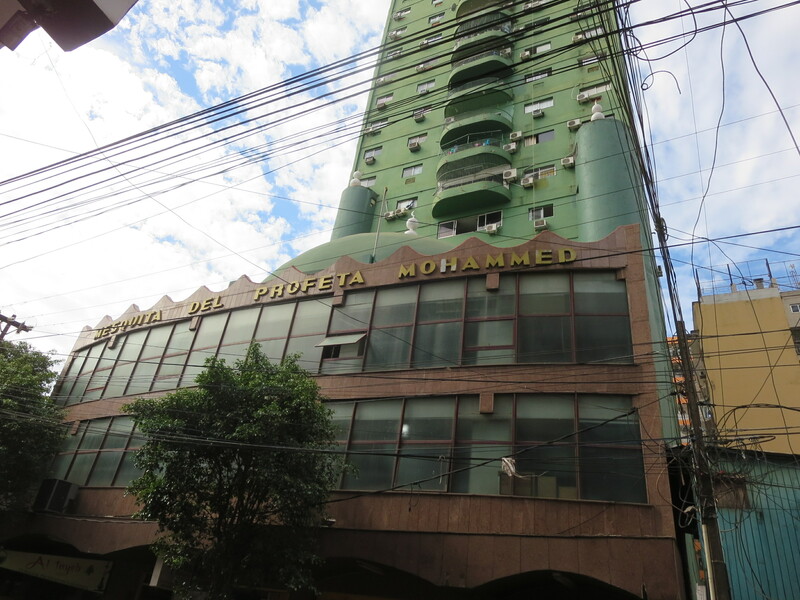 a mosque, apartment building, food court, and barber shop all in one! In short, I can see that the lax (or non-existent) border controls in the area and the endless rows of shops and markets stalls plied with counterfeit goods (along with ever-menacing ‘Arab’ population) in Ciudad del Este may give rise to concerns for some, but calling the region ‘lawless’ is simply inaccurate. Perhaps many of those articles were written from afar, but from our experience on the ground, admittedly a few years later on and without serious investigation, it seemed more an intriguing mix of cultures and an orderly-enough place, despite the lax border controls between neighbors who evidently feel comfortable with each other’s citizens. So nice it was, that we may even be future property investors! Not a bad spot to hang! I have never been that interested in soccer, which is a fact that separates me from about 90% of the male-aged population on this particular planet. Something about the seemingly pointless kicking around of a ball for 90 minutes in order to set up two minutes of actual action has never made a strong impression upon me. Nonetheless, I do own a number of soccer jerseys from various countries visited around the world, given my penchant for being a poser, and I enjoy a good random sporting event in other countries, especially when I am oblivious to the rules (or even objectives) of the game. Fast forward to the second of the two Boca Junior matches, on Thursday of that week. The two clubs had played against each other the previous Sunday, a game for which Nick’s uncle had inquired about getting tickets, only to dismiss that notion upon discovering the $1,000 price tag. So we watched that game at his house, a barnburner 2-0 victory for the home Boca team that we were supposed to be cheering for. That game, however, was a league match – so like a regular season NFL game between division rivals (a la the mighty Redskins versus the pusillanimous and downright dirty Cowboys). The second match, and now this is where soccer gets quite confusing, was the first in a two-game series for the first round of the Copa Libertadores, a competition in which club teams from all over South America play each other for a title. So it’d be like if the Rhein Fire (if they still existed), Toronto Argonauts (if Canadians recognized the concept of competition), New England Patriots (if they brought their own air gauges), and the Ulan Bataar Ice Khans (if I was their captain) all played each other randomly for no real reason. So basically there are two different competitions going on simultaneously, and it just so happened that Boca was matched up in the Copa Libertadores against River around the same time as one of their regular season draws, allowing them to play each other twice in a four day span for two completely different reasons (got it? I still don’t). So having failed at getting tickets for the regular season first match, we figured there was no possible way to score seats for the second match, what was essentially a play-off game. Lo and behold though, Nick’s aunt worked some Argentine connections, and on the day of the game (the night match being at 9:30pm – very in-line with the nocturnal lifestyle), she informed us that she had scored tickets. Two tickets to be exact, to be divided evenly amongst the three of us. There was an awkward moment of “oh, I see . . . ” as we all knew what had to be done before anyone verbally broached the topic. Christine, bless her heart, quickly recognized the dilemma and expressed that she did not have to attend, allowing Nick and I to utilize the two tickets (as evenly as could be). There was one other hitch, however. 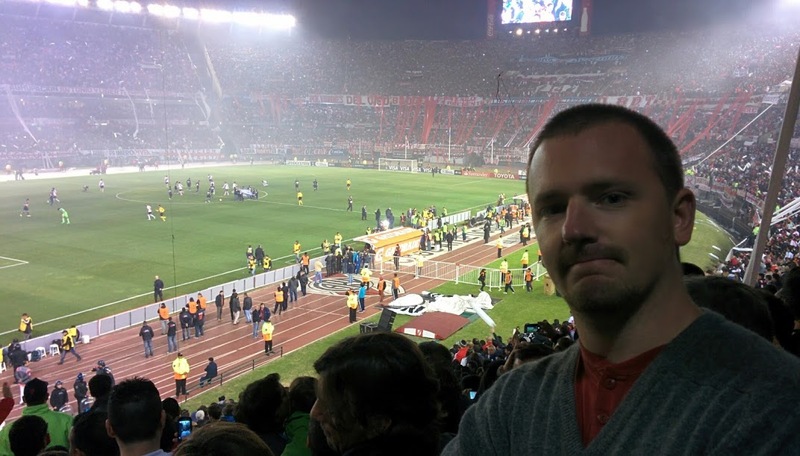 The game was to be hosted at River’s stadium, and Nick is a die-hard Boca fan. Soccer hooligans are a real thing here – to the point where in 2013 the Argentine Football Federation decided it just was not worth it to have away fans in attendance, and banned them from attending the home games of opposing teams (you might wonder how anyone could truly prevent away fans from attending given that you don’t demand the loyalty of the ticket buyer via polygraph at the time of ticket purchase, but it is more of a self selecting situation as opposing fans before sat in a completely separate section of just their kind, being too dangerous to mix in with the opposition). 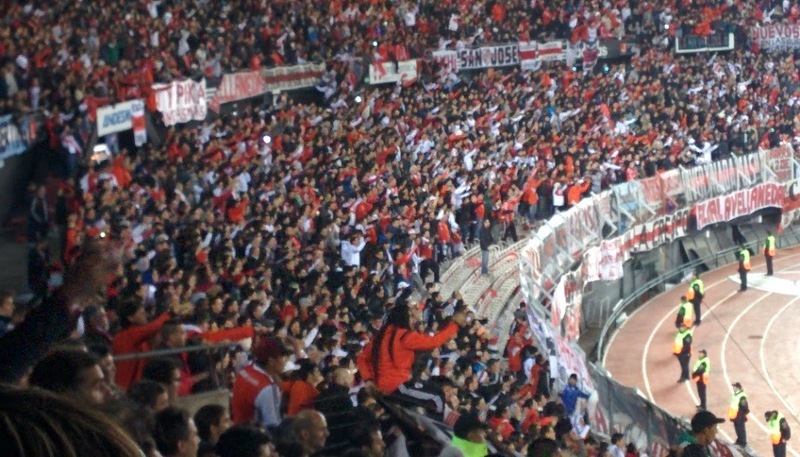 This new enactment came after the death of a fan during clashes following a match near Buenos Aires, making over 70 fan-related soccer deaths in the country since 2000. So it’s a pretty big deal to be found in the wrong crowd, meaning that Nick was going to have to suppress every instinct he had to feign support for River, or at the minimum a level of healthy ignorance (in contrast, Nick’s uncle specifically informed us ahead of time in case we obtained tickets, he would not attend the game at River, as he ‘would not be able to control himself’). On the plus side, however, was these were not just tickets, but VIP tickets! 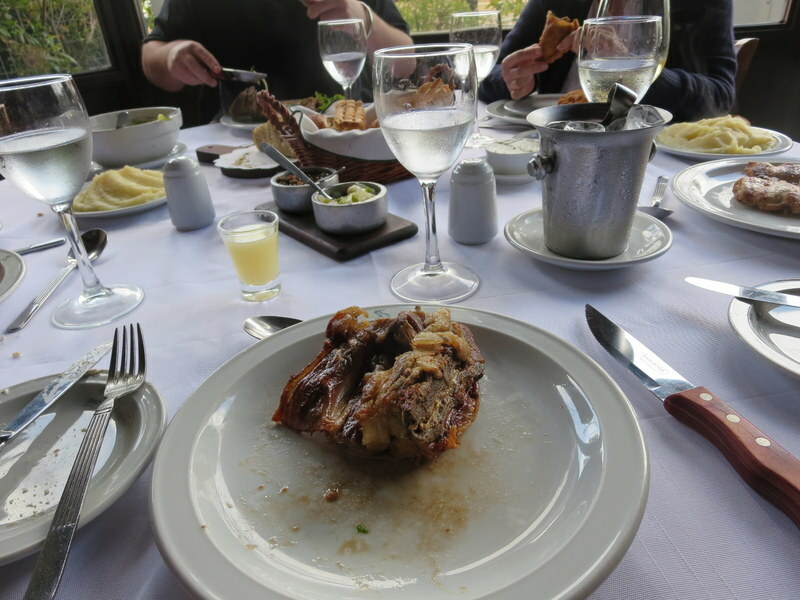 We had no idea what that meant in the Argentine context, but were hoping at a minimum for a lifetime supply of beef. Nick’s uncle dropped us off as close as he could get to the River stadium, which was still about a two-kilometer walk. The roads to the stadium were completely blocked off to traffic ahead of the game, and the police began checking up to a kilometer ahead of the venue for tickets, only letting those in possession passing by. The environment just walking up to the stadium was intense – alcohol is also thankfully banned from the stadiums, so fans were getting their fair share in ahead of time. It seemed like everyone was chanting in unison to lyrics for which I had apparently not received a memo, nor could find printed on my ticket. Given my limited Spanish capabilities, I could not pick up on the subtle pretext of the crowds’ words, but I understood enough to realize it was not appropriate for my PG-13 rated ears. And everyone sang, from the recently christened 5-year-old fans to hardened 85-year old veterans. There were also a ton of police lined up all over the streets – reportedly up to 1,700 had been deployed for the purposes of this particular match. These police figures were often the subject of derision from the local crowd, with many a crotch grab thrusts in their direction. I guess without an away crowd to direct aggression towards, the police became the next best target. One other thing I should mention – Nick is such a fan of the opposing Boca Juniors team that he has a tattoo of their initials going down his (left?) bicep. Now it was a bit of a cold day, so we were wearing long-sleeve shirts and jackets – thus no incriminating skin was exposed. But as we walked the long walk to the stadium amidst this oppressive and intimidating crowd, with Nick believing everyone knew his secret and had a bull’s eye on his back, I began to envision some ridiculous scenarios in which his arm would somehow get caught by a protruding nail on a piece of wood in a nearby trash can, or some other similar sharp object, ripping off his upper layers as he struggled to get free in the process, leaving his torso and thus secret exposed. I decided that in the case of this unlikely but still harrowing scenario, I would not wait a moment’s notice, but just take off running. In what direction it did not matter, as I had no idea where anything was, but just as far from Nick as possible. Twenty years of friendship is great and all, but survival is important as well. Thankfully in the two-kilometer lead up to the stadium, this situation did not come to pass. Given the lengthy walk to the stadium and our inability to find the VIP and not regular people entrance (meaning we had to back track even further amidst the hooligan crowd, as you couldn’t just enter into the stadium grounds and walk to it from there), we missed out on much of the VIP party. 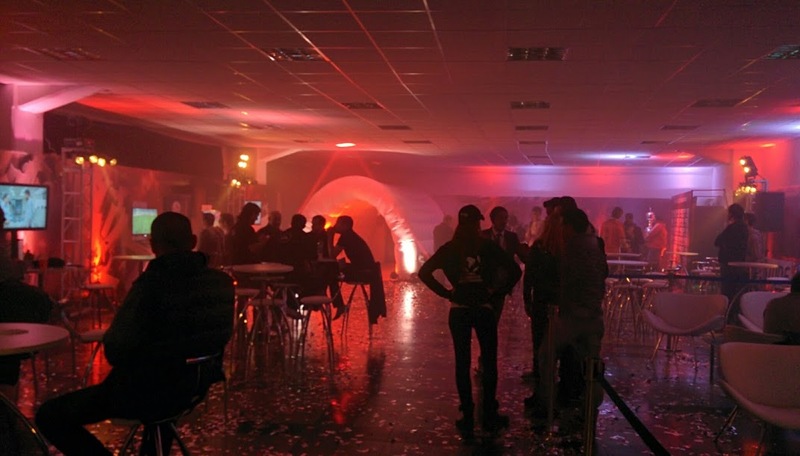 We got there late, but there was a room we were granted entrance to that clearly had had a healthy dose of a fog machine with some confetti. 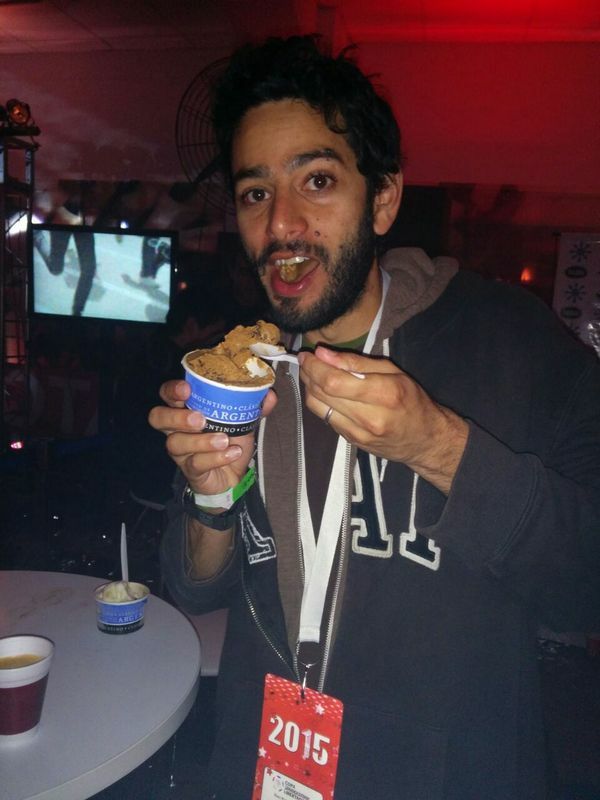 There wasn’t much left – the food was gone, but luckily there was still Freddo’s ice cream available. We got a quick dulce du leche cup, took some photos amongst a trophy, watched a FIFA match on a PlayStation set up, and then exited to try to find our seats as the players entered the stadium. Upon entering the actual crowd, the atmosphere was electric. I’ve been to a number of Redskins games in my time, but I can say this was genuinely something beyond what we call sports passion in the United States (perhaps it has something to do with the team for which I happen to feel passionately about . . .). Every single person was wearing red and yelling their hearts out – and nothing had even happened yet. There weren’t even any cheerleaders or other crowd pumper uppers – there was just no need for such gimmicks. It was an instant sense of awe that came over me, just by simply walking into the actual stadium grounds. In fact, I’ve basically stopped going to football games back home given the high ticket prices, ubiquitous large screen crystal clear HDTVs, and the hassles of trekking out to FedEx field, but if the atmosphere was anything like this was, I’d be inclined to see the action first hand on a more regular basis. Of course, even though our section was technically the VIP section and thus less raucous than other sections of the stadium, it was still a rowdy crowd. I looked over and saw in the section next to us someone had basically passed out and 4-5 people were carrying him away, motionlessly. I wasn’t sure what happened – some in the crowd said he was too old to handle it, but the intensity of the game claimed it first victim (and the match hadn’t even really begun). Another interesting aspect is that no one pays attention to seating assignment. In fact, they actively disavow it. Rather, if you are in your general section, it’s a free for all – something we did not realize. Thus getting there late, right before kickoff (is that a soccer term too? should be), did not put us in an advantageous position as somehow basically all the seats were taken. We saw some guys sitting in our seats as we entered and decided best not to broach the subject in hostile territory. Rather we stood in the aisle at the side, perfect since no one was sitting anyways. We were, however, very close to the field with a great view, to make up for it all. At halftime, more comfortable in our surroundings, Nick decided to get the guys to move, but to no avail. They said someone had told them to sit there at the beginning when they arrived, even though we clearly showed them where their seats were, a few rows back. It was an odd sort of Argentine stand off, with them clearly recognizing they were not in the seats printed on their ticket, but also clearly expressing no inclination to move. We kind of stood there for at least five minutes going around in the circular sort of argument, as they basically assumed we would eventually give up and leave them alone. They were right. Nick finally took their tickets in exasperation and gave them ours, and we tried to sit in their seats a few rows back. Of course, those seats were empty, but a family sitting nearby told us they were holding them all for people who would return after halftime. Distraught, someone took pity on us and showed us two seats together in the middle of the last row. We happily took those, until about five minutes after halftime when a larger dude than us came out and said those were his. Opting for the pacifist route, we meekly moved to a different aisle, and watched the second half from there. As for the game, it was a 1-0 result as I predicted (and have always predicted each and every soccer game will be, with about an 80% lifetime success rate). The home team won – though it was apparently on a late and poorly called penalty shot, requiring Nick to suppress an extreme amount of rage. Luckily though, given that the home team won, no one was shanked. The exiting crowd was in a triumphant mood, and Nick had not been out-ed as an enemy, so we were able to make a departure from the stadium unscathed. Nick’s depression over losing the game was heavily outweighed by my jubilation of making it out alive of the perceived enemy’s den, with nary an incident (we did both pretend to be confused foreigners anytime someone commented to us about an assessment of the play, which I suppose was 50% a truth). On the way out we did see a car window smashed to pieces with the insides ransacked – interesting given the 1,700 cops posted around, but I didn’t really like the car anyways, so worked for me. I can’t say that I appreciate the game of soccer anymore after those 90 minutes of (in)action, but I did enjoy the spectacle of fans so passionately pouring their hearts out over what is ultimately a pointless round of exercise between two groups of young adult males. It is something I can relate to (though my sporting events tend to end in utter despair – so I didn’t quite comprehend the ability to leave a stadium ‘happy,’ as these fans did). The obsessive passion behind sports extends worldwide, but I do have to say the futbol fans here have exceeded anything I have witnessed before. Perhaps it’s a necessity, as the less exiting the game, the more exciting the crowd needs to be to make up for it! 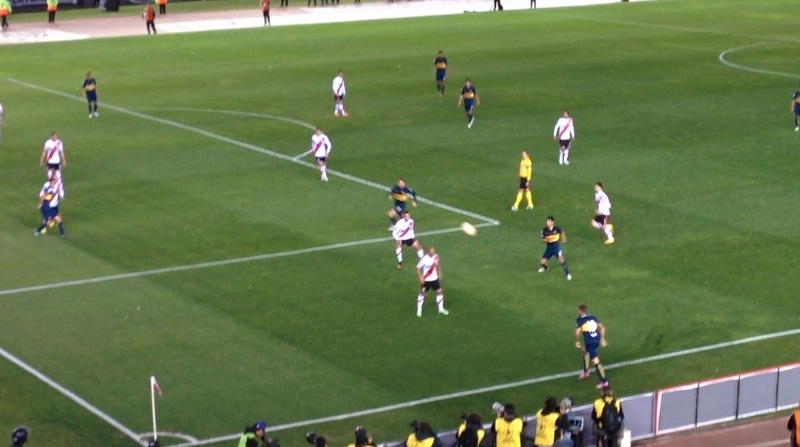 Post script: As a testament to just exactly how insane soccer fans can get in Argentina, the second half of the two-series match for the Copa Libertadores between Boca Juniors and River Plate took place the following Thursday, this time at the Boca stadium. When the River players came back onto the field after halftime, some Boca fans sprayed them with some sort of ‘irritant,’ sending four to the hospital and forcing the match to be suspended (at a 0-0 tie). Imagine the chaos if away fans were actually allowed into the stadium as well – I think Argentina would be in the throes of a civil war by now! As of April 26, 2015 (yes, I know I am slow in disseminating information, but I am typing all of this on my flip phone), we are done hiking! Forever! 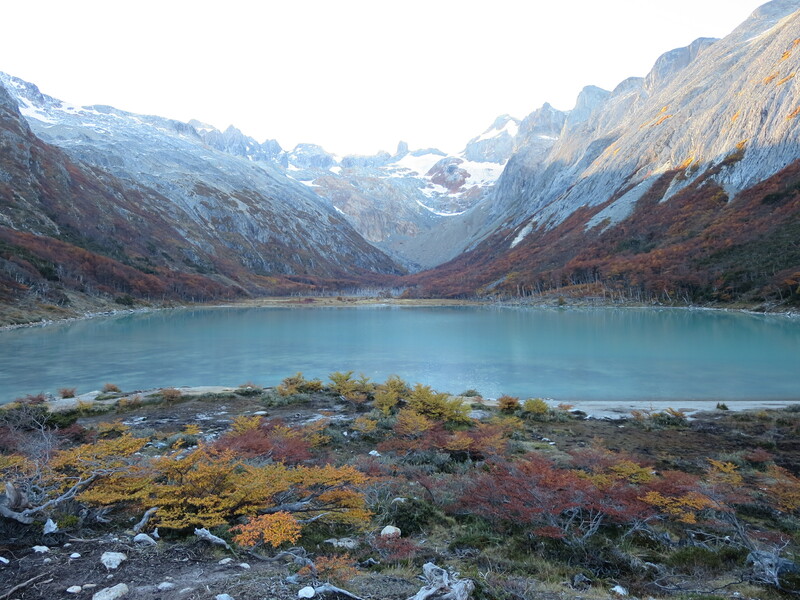 After 16 days in Patagonia, we are finally leaving the region, prepping for a 28-hour bus journey to the town to Trelew (which is still technically in Argentine Patagonia, but considered distinct for the purposes of this post – yes, I have the power to redraw ill-defined subnational boundaries through the words of this blog, I bet you didn’t even realize that. Maybe you’ll be nicer to me now. Maybe). After countless beautiful lookout spots combined with a similar illimitable number of wet and stinky socks, we are officially putting Patagonia in the books. 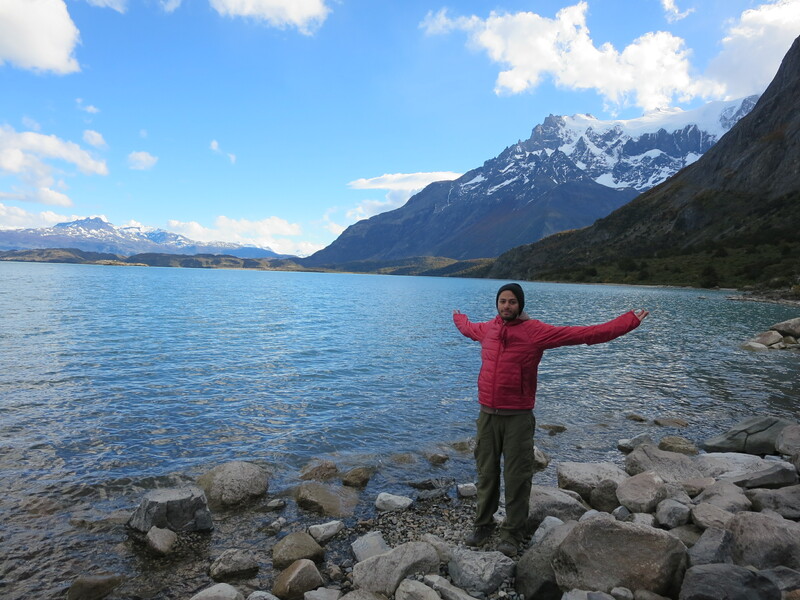 While we were hiking the “W” in Chile, we met a number of people who had come from Argentina, where we were heading next. 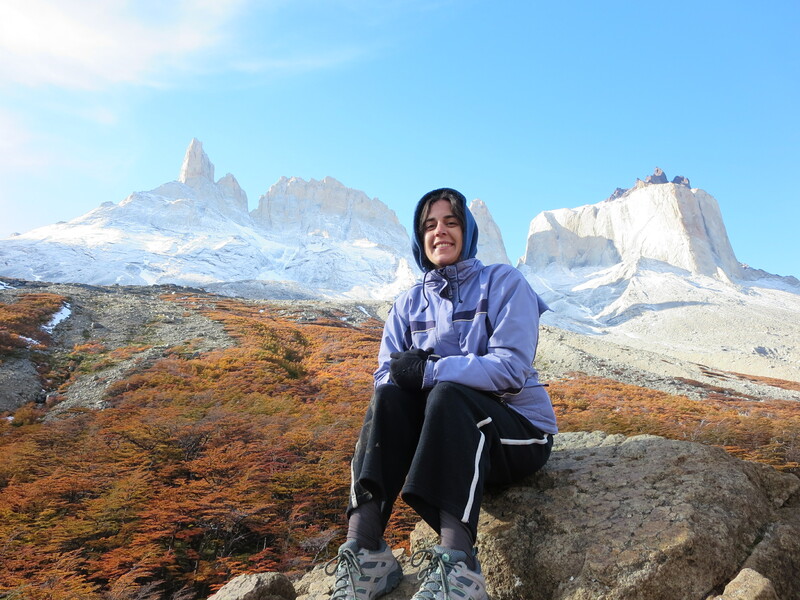 In talking to them, it came up that there was one tourist company (Hielo y Adventura) that actually had permits to take you out hiking on the top of Perito Moreno, the most famous glacier in Argentina and one of the largest/most accessible in the world! One couple did it and highly recommended it, while another said it was the one regret of their trip not to do it as they heard such good reviews. It was not in our initial plan and was quite a bit more than we had planned to spend, but ultimately we decided to go for it. Highly recommended and how many opportunities do you have to walk on top of a glacier in life? Probably only 4, so take advantage! Being the planner I am, I tried to email and reserve a few days ahead, but was told the reservations had to be done at least 10 days in advance or in person. We arrived in El Calafate, the town closest to the glacier, early afternoon. After exploring hostels for the best deal in town, we went straight to the ticket office. We were in luck! They had a few spots open for the next day. After multiple trips back and forth, exchanging money on the black market (official exchange rate is about 8.6 pesos/dollar but you can get up to 13/dollar unofficially), and showing passports, we had our tickets in hand! The next morning, we were up outside our hostel at 6:58 AM, as the bus was supposed to pick us up at 7AM. The stars were still out shining as sunrise is not until around 8:30AM down here. The bus picked us up and I had us strategically sit on the left side of the bus, per Lonely Planet’s recommendation, and we were off. About half way through the 1.5hr drive to the national park, it started to drizzle. The forecast had said afternoon rain, but it seemed to be getting an early start. As we are driving through the park to get to the glacier viewing point, the first activity of the day, the driver is talking about all the things that we should be seeing our of the left side of the bus, but actually cannot due to the fog and rain. As we get out of the bus, we see a rainbow next to glacier, a hopeful sign that the sun is somewhere around the rain would soon be behind us. 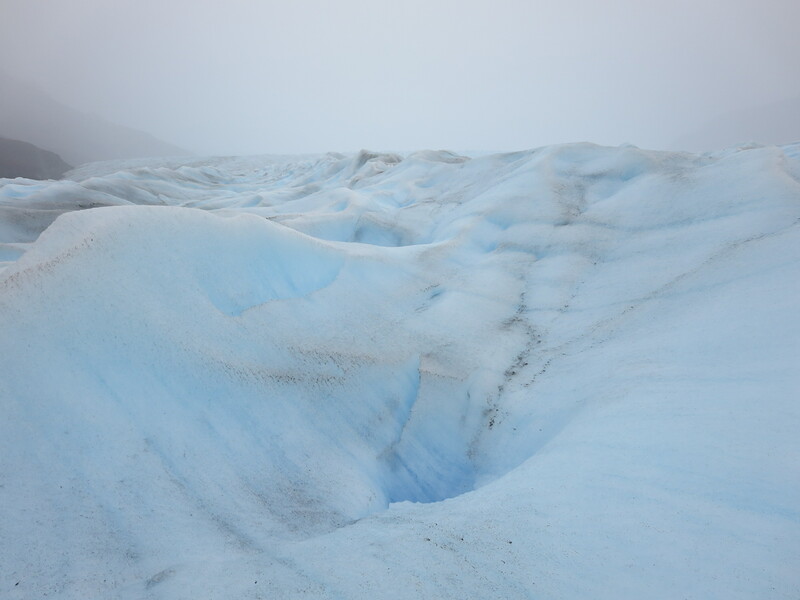 We had an hour to walk around a network of viewing pathways to see the north and south side of the glacier. The glacier is incredible, close to 11 stories high of pure ice walls, and that is just out of the water, it is close to 30 stories if you count what is underwater as well. It is up to 11km wide and 30km deep. 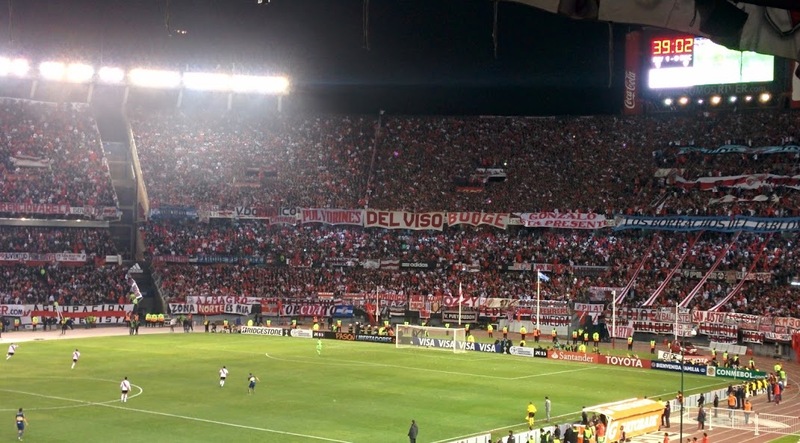 Big enough for the entire city of Buenos Aires to fit on top of it! 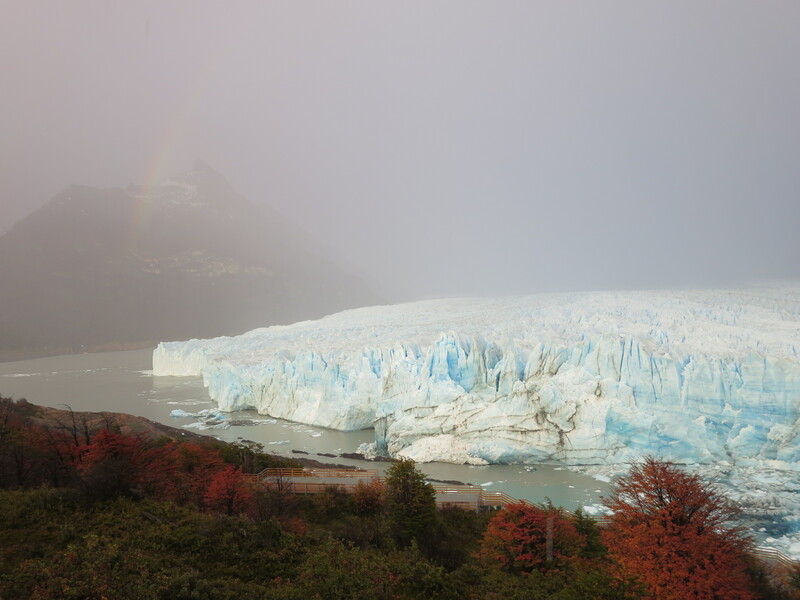 We look at the glacier from various angles, watching ice fall off the walls into the waters, creating mini icebergs. All the while, the rain is getting harder. After an hour viewing, we head back to the bus, which drives us over to the pier, where we board a boat to take us next to glacier. What would have been a beautiful boat ride, even for someone who gets seasick looking at boats, was difficult to enjoy as all of the windows were fogged up and it was pouring rain outside. No worries, it can’t rain all day right? And we are going to be walking on this thing soon enough, so we will see it up close. We get off the boat pretty much next to the glacier. I already feel that this trip is going to be worth it as being so close, you really get a sense of the magnitude and beautiful of this hunk of ice. We have to walk about 1 hour along the side of the glacier before we get the point where we can do our ice trekking. The first 15 minutes are along this nice almost boardwalk like path that ends at a point where the mini-trekking people went out, a shorter version of BIG ice. 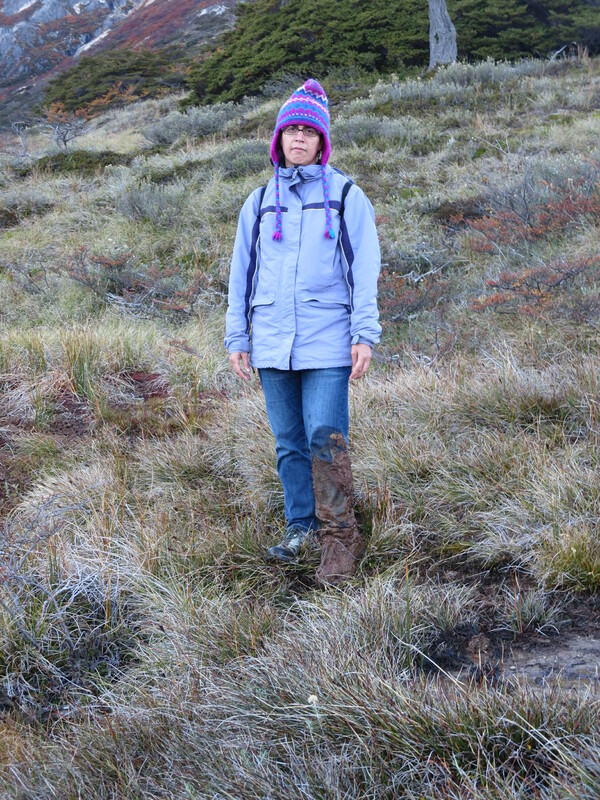 At this point, our guide says, if anyone would prefer to do mini-trekking due to the weather, let me know now because once we go, there is no turning back. If you are wet and miserable, you will have to continue. This is the part where we should have realized what was in store, but no one budged. We had signed up for BIG ice and we wanted to do it! Come hell or high water. We continued on with our hike. While the rain was a constant, my feet were surprisingly dry with my wool socks and waterproof hiking boats. 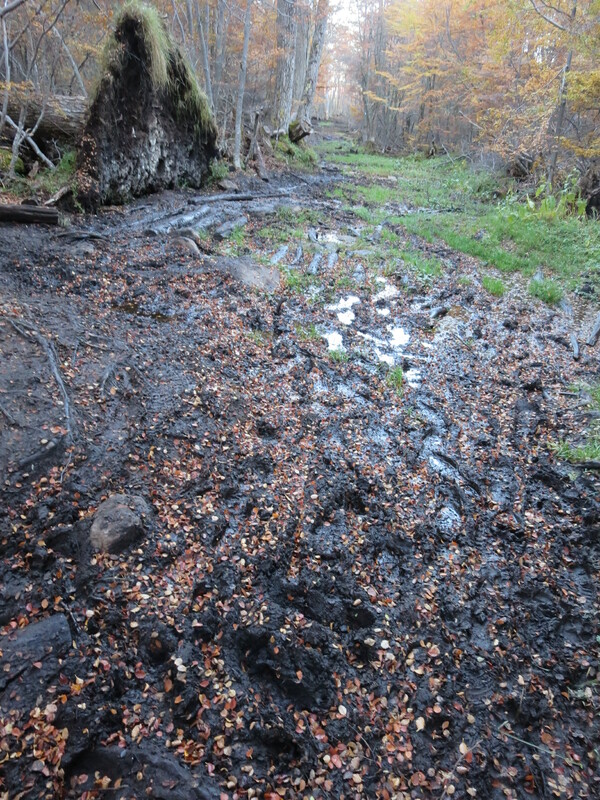 I stepped carefully as we trudged through some muddy areas, now clearly off the manicured path. All the ended when we hit the waterfall. This waterfall was next to the path and there was a little wooden bridge, about 7feet long, to get over the river streaming from the falls. Perhaps on a normal day this bridge works great, but this was not a normal day. Due to the rain, it was running faster than normal and the wind gusts blow the waterfall directly onto the bridge with a gust probably every 5 seconds. 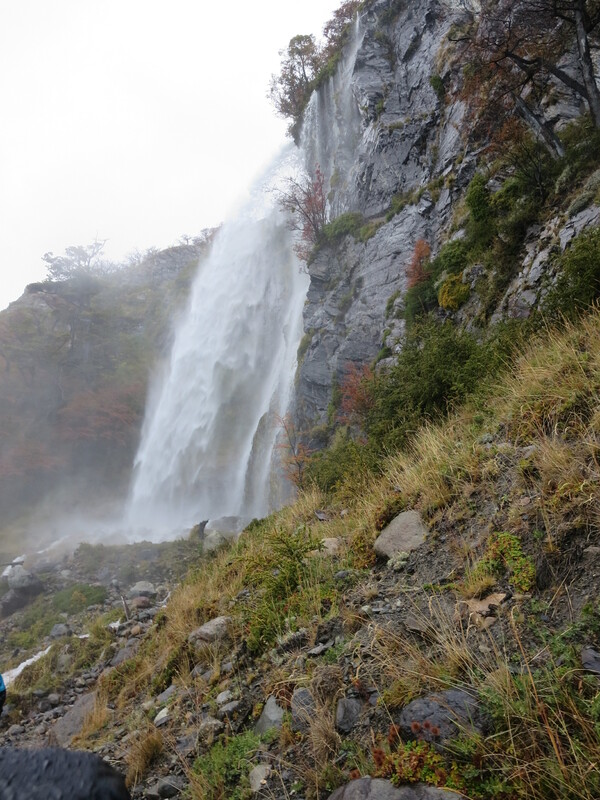 Each one of us, as we crossed, was drenched in a shower of waterfall. Goodbye dry socks. Just when I started to feel down about my socks, the guide stops us and tells us that the rain is coming down so fast, that there is a strong risk of landslides, so we will have to talk 15 feet apart. That way if a boulder falls down, it will likely only kill one of us and not the whole group. Yes that is a direct quote from our guide. I am now wondering what we have gotten ourselves into. We all get across with no issues, but you can see the side of the mountain changing around you, new rivers appearing as the rain accumulates. We finally get to the tent were we get fitted for crampons, but the other group got there first and are all inside, taking their sweet time, so they don’t have to be in the rain. We had to stand out in the rain and wait. Once we are all fitted up, we head to the ice. 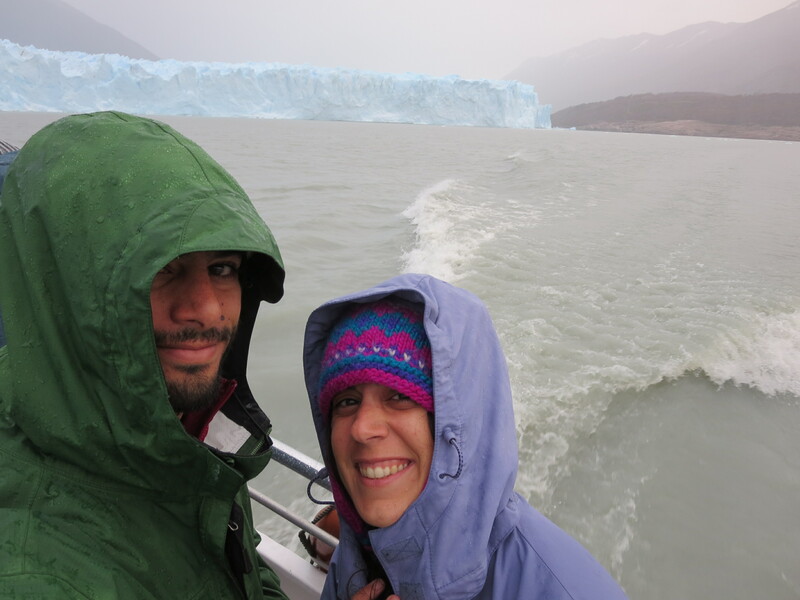 Everyone is soaked and, being so close to the glacier, freezing as well. The guide that straps on my crampons has to stop because of the pain in her fingers as they have gone so numb. Once we get on the ice, however, it is like entering another planet. Sand dune like icescapes of various blue tones, deep crevices of water that are so pure blue you look down and can’t tell where they end. We walk around for about 2 hours, visiting various crevices and holes, each more beautiful than the next. At one point, the guides hold on to you as you look over the edge of a waterfall within the glacier. Unfortunately, due to the pouring rain, we don’t want to take our camera out too much for fear of ruining it, so can’t share too many pictures. Trust me, it was amazing. After two hours of our supposed three hour hike, our guide tells us we have to leave quickly, the rain is coming in too fast and there is a lagoon forming on the side that is not safe for us. Remember that hell or high water, well here it comes. As we walk back on the ice, we see the side of the mountain next to us pouring down. You can tell the guides are worried, they keep telling us to speed up because we need to get out of there. We finally get off the ice and to the point where we move over to mountain. The water has risen, so you just have to step your whole foot into this freezing river to get across. Once across, the guide had us go one at a time to get past the landslides. When my turn came, I was about to go when the guide told me to wait. I stop and look up confused, he points to a spot above me where the rocks albeit small, are just tumbling down the path I am about to head on. I make it across to the other guide who says, “It’s a big adventure, no?” What did we sign up for? It is not over. Once we past that point, we turn the bend and there is our good friend the waterfall. The water has become even more violent and has flooded the path around the bridge. Multiple guides are lined up along the path to help people across. I get to one spot, where you are standing on a rock in the middle of the rapids, and there is a guide about six feet away with his hand out. He is telling you to walk into these rapids, but is too far away at this point for you to grab. I just jumped to where I had seen other jump and there was a rock that 2 hours ago was above water, but now was just below. The guide grabs my hand and pulls me over to the bridge, where we all once again get a waterfall shower. At this point, I just want to get back, I beeline back. When I finally get to the boardwalk path, I can breath. I am going to make it out ok. What were theses people thinking??? I know they told me they never cancel, but this is ridiculous. They have a fire and coffee waiting that the lodge. I head straight to the fire and try to warm my hands with the rest of the group. The boat arrives about 10 minutes later and they hand out glasses of whiskey. I don’t usually drink whiskey, but today it goes down easy. We cross the lake, get on the bus, all wet and cold, and head back into town. Certainly not what I had bargained for when I signed up for BIG ice, but it was an adventure. And, despite all of this, would I recommend it? Hands down. Walking on a glacier was amazing and worth it, just check the weather report before you buy your ticket! You can’t win them all, especially at the end of the world. Ushuaia, the southern most city in the world is a pleasant enough place to walk around in itself and marvel at the spectacular setting right on the water surrounded by mountains on three sides, while realizing you are truly at the end of the earth. Beavers are apparently nocturnal animals, working hard to build their dams at night. They hang out at a spot a little out of town, which also doubles as a hike to a lake in the mountains. Seemed like a nice enough way to spend the afternoon, trying to time our return from the four-hour hike with sunset to catch a glimpse of the beavers in action. 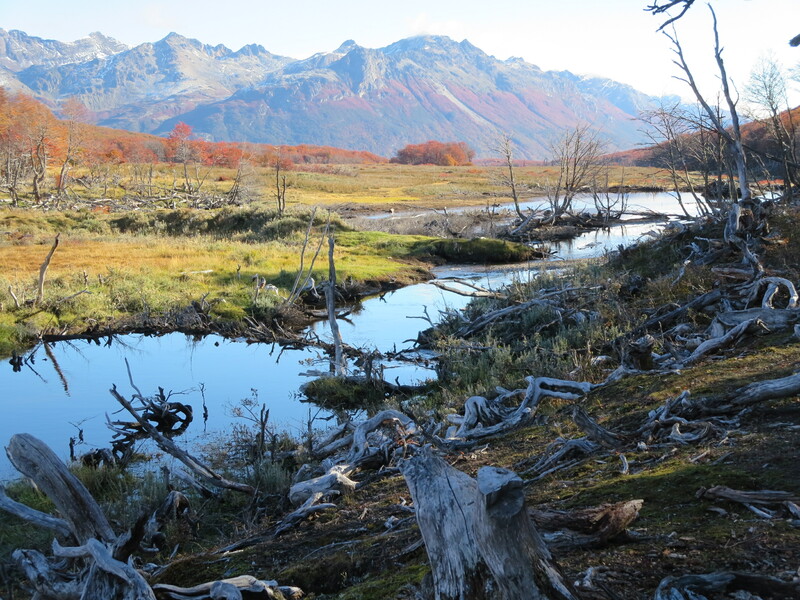 Part of the appeal was that these particular beavers have been prolific in building their dams, and by default destroying the local habitat, as they have no natural predators down in Tierra del Fuego. Whatever the actual environmental implications of such a situation, none of that has stopped it from becoming a fashionable Ushuaia tourist attraction. 20 kilometers of hiking in this?? A little bit of mud was a little bit of a understatement. Much of the area was covered in peat bog, making it quite squishy to walk on, kind of like the marshmallow land I used to always dream of. That was the fun part – the other part of the hike was a complete mudfest, the likes of which I had not seen since partaking in South Korea’s annual mud fest (an odd event held in Boryeong every summer). 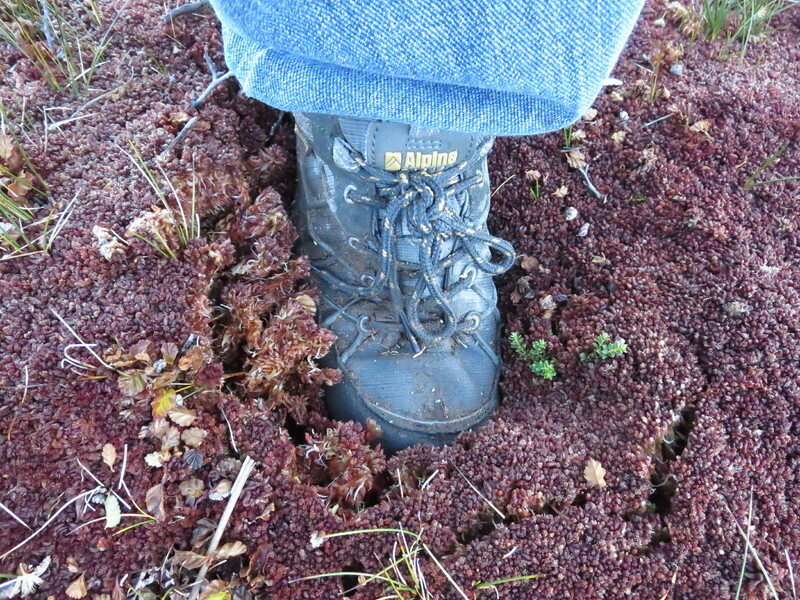 The problem was that a good amount of the mud hid amongst the squishy peat bog, making it difficult to be truly confident on where you were walking – to the point where a two-foot mud hole could be anywhere. And they were! I was the first us of to become a victim, slipping early on to the point where I nearly lost my shoe in the muddy abyss, with the remaining area between my sock and sole subsequently filled with mud. 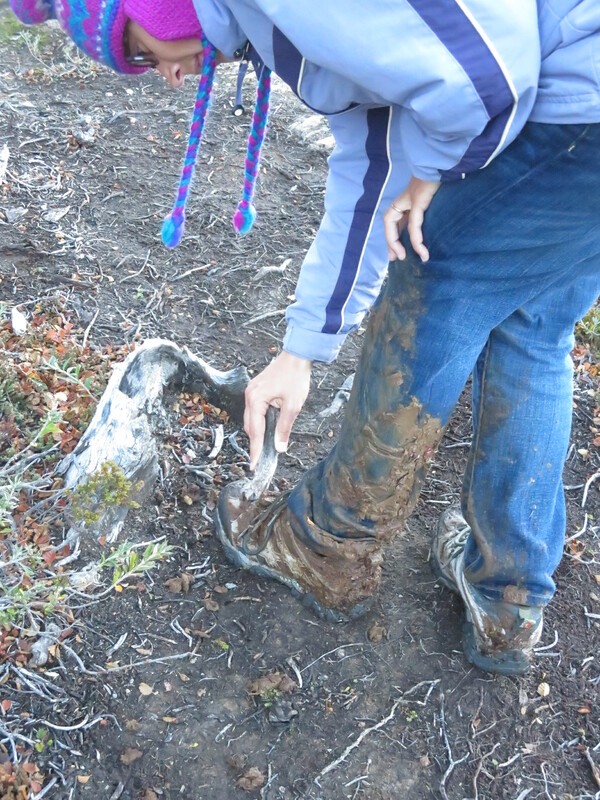 BUT Christine took the (mud) cake, stepping in a sink hole up to her knee at one point. At any rate, we made it up to the lake amidst the mountains, which under any other circumstances would’ve been sublime. Unfortunately we were there days removed from the Chilean Patagonia Torres del Paine National Park, and everything in life is relative. 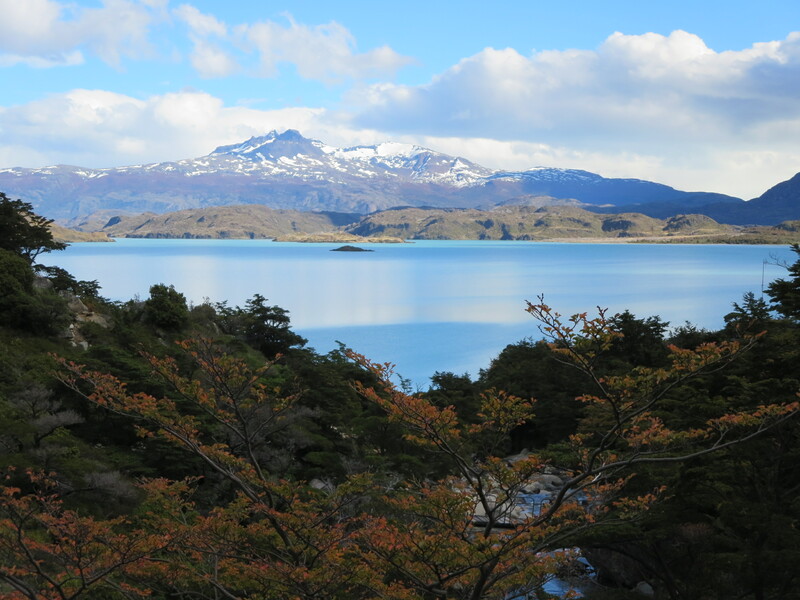 Thus a pretty view, but not one we had been lacking in recent days (perhaps we had become a bit spoiled by Patagonia, happens to the best of us). To top it off, we got back to the area where beavers apparently hang out and work, with much evidence of their presence. It was another 20 minutes through the woods back to our pick up point, but unfortunately we had forgotten our headlamp, so couldn’t wait too much after sunset for the fuzzy, wet creatures. Plus it was freezing cold – it was the end of the world after all. We waited for about 30 minutes, as long as we could until it was getting quite dark, with no signs of any beavers in sight. Perhaps it was national beaver holiday we were unaware of, perhaps they hate trudging to work in mud as much as we do (and took a ‘mud day’, as we should have). 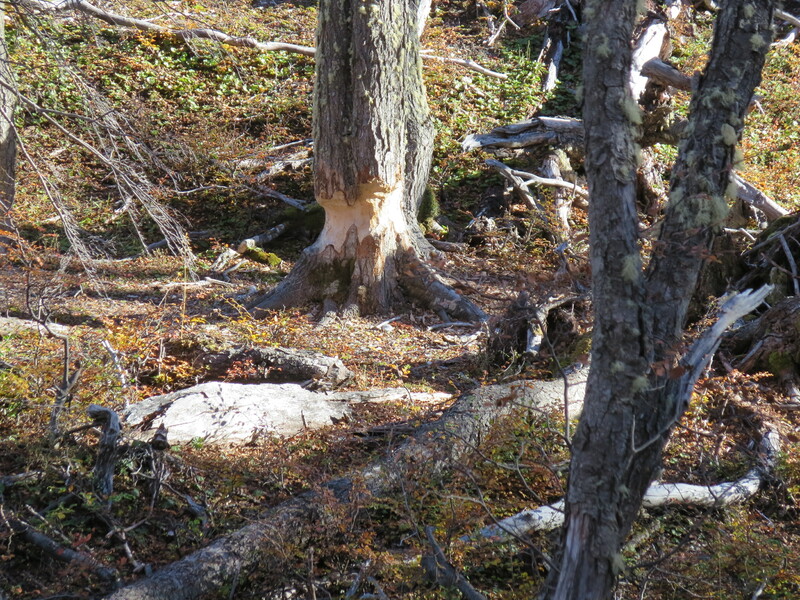 Evidence – beavers were here! So we froze, doused our in mud as part of an emerging fashion trend that no none-homeless individuals seem to be following us on, and unwittingly did another hike after promising to take it easy for a while – the best part being that we had just paid and arm and leg to get all our laundry done (literally, good thing I always pack some extra limbs when traveling). All that for some dam-builders who were too lazy to even show up. 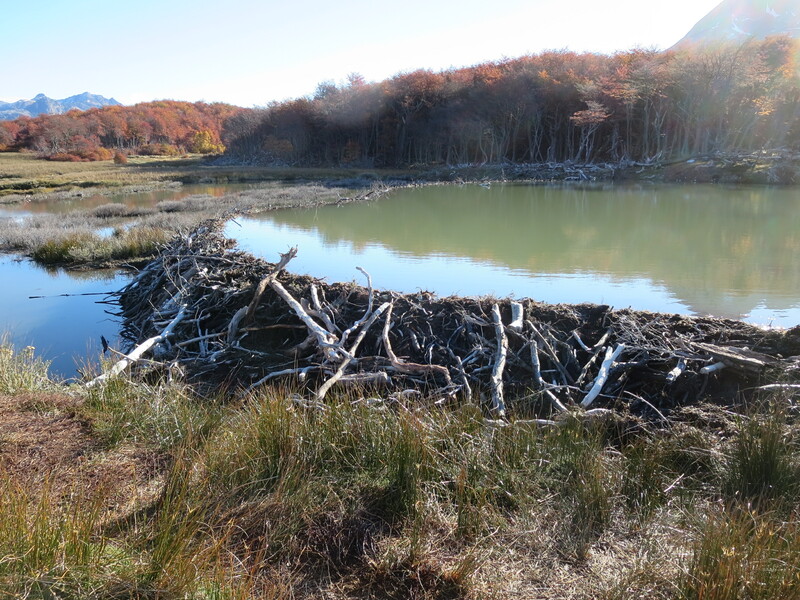 The beavers of Tierra del Fuego may not have any natural predators in the area, but they sure have two unnatural ones now! Beaver homeland – we will be back . . .